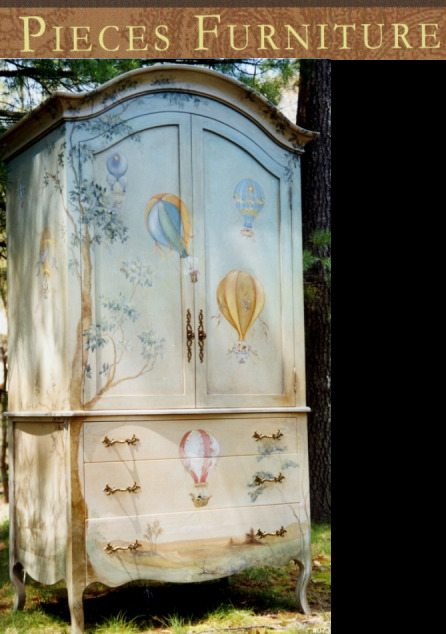 PIECES is a unique line of hand painted furniture, inspired by the best of Eighteenth Century style. Pieces offers classic designs in oils and faux finishes with soft vintage ageing, washed in a variety of colors. The furniture is made in New England of solid poplar and birch and is designed by Jane Harrington. It can be customized in size and decoration and features the modern day functioniality of computer statioins, TV and media centers, behind the doors of beautiful old world quality furniture. These last 15 years Pieces artists have worked closely with their customers to incorporate their room colors and fabrics with the furniture. Drawing on inspiration from from French 18th century tradition, Jane Harrington, was influenced by Classicism, the Baroque and Empire periods and soft colors from the Scandinavian tradition. The furniture is intentionally antiqued and worn to feel lived with. Her sculptural sense of design is evidenced in the sinuous curves of her furniture. The decorative oil painting on the surface traces these curves and moves with an elegant flow wrapping each piece. The PIECES line of furniture bears the brush strokes of an artist who loves the vitality of wood and hopes to bring this time worn artistic tradition to you.